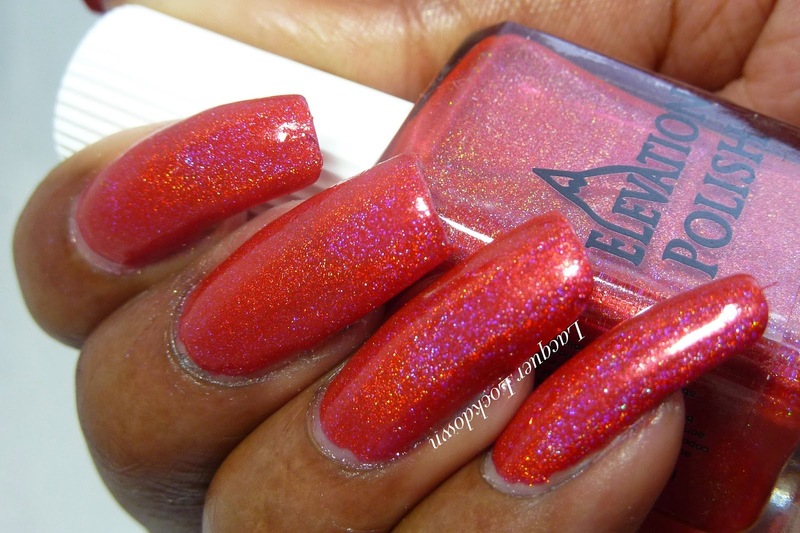 Lacquer Lockdown: Elevation Polish Minneapolish Collection Swatches and Nail Art! 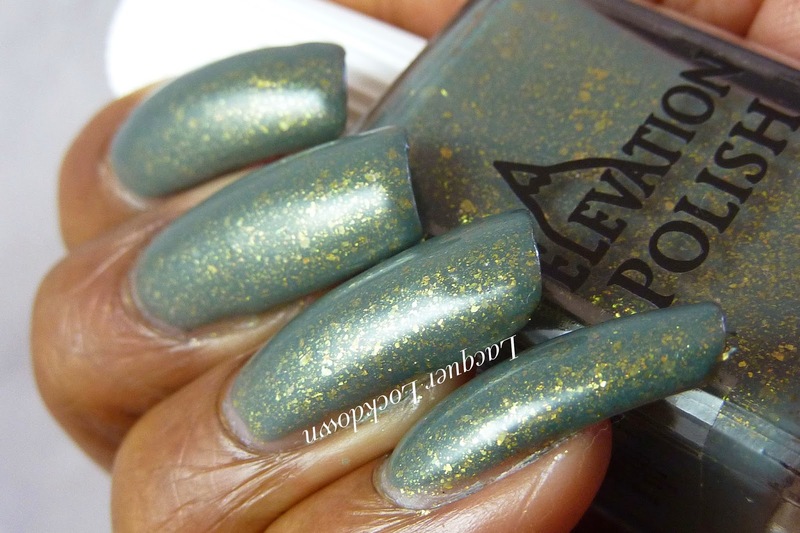 Elevation Polish Minneapolish Collection Swatches and Nail Art! 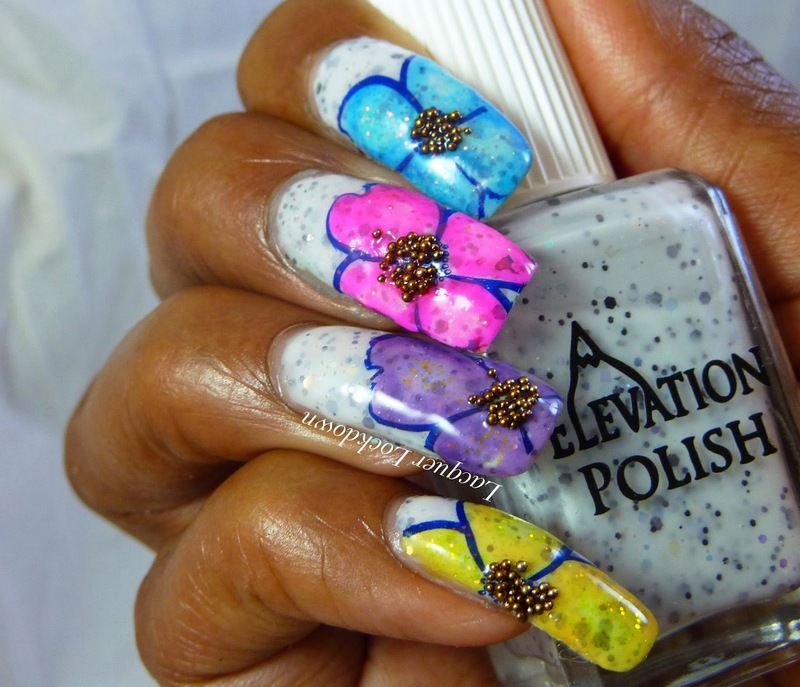 Time for another monthly Elevation Polish post! Yay - elevate the world!!! Lol let me stop, but seriously this months' collection, The Minneapolish Collection made me so happy and thrilled even in the heart of winter. Packed full of what I consider serious color burst and saturation. As you can guess this collection was inspired by the city of Minneapolis and some of Lulu's favorite plates scattered throughout the town. It's a reflection of her love for the city and from what I can see while she may travel the world clearly there is no place like home! A creme self-leveling cornflower blue. Hmmm what can I say about this lake? 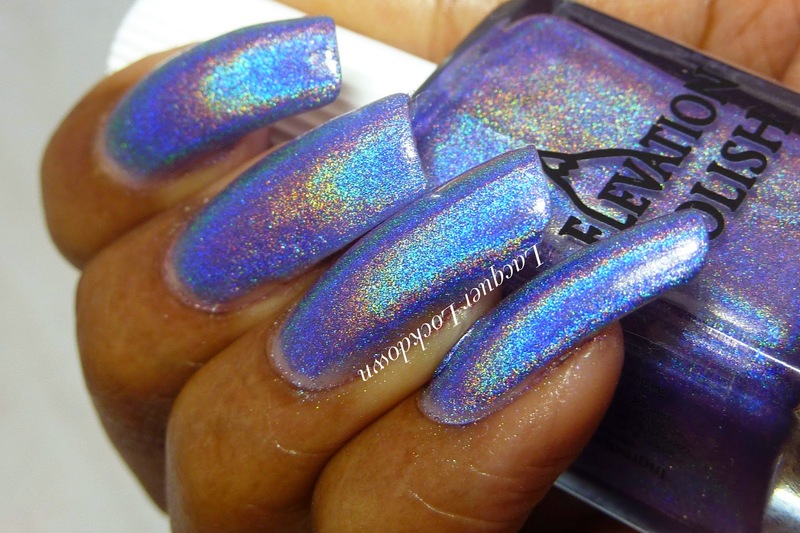 It must be damn gorgeous in real life because when I put this polish on I just wanted to run around and show people look look isn't this beautiful. 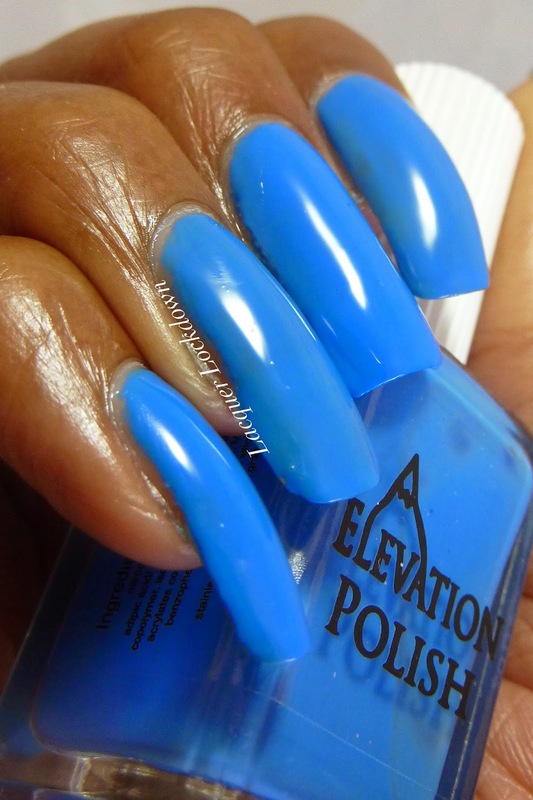 Seriously we all know I have an epic weakness for the color blue, but look at how beautiful this polish is! Opaque in roughly 2 coats pictured here with no topcoat. Look at that shine! 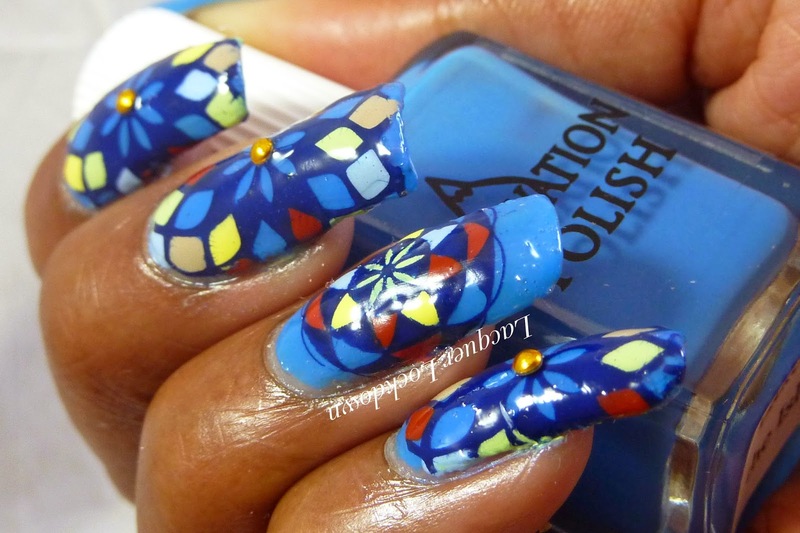 And all of a sudden I was building kaleidoscopes with this polish. I wanted to capture the bright blue while showing you how Lulu's colors always end up playing well together no matter from which collection you choose. 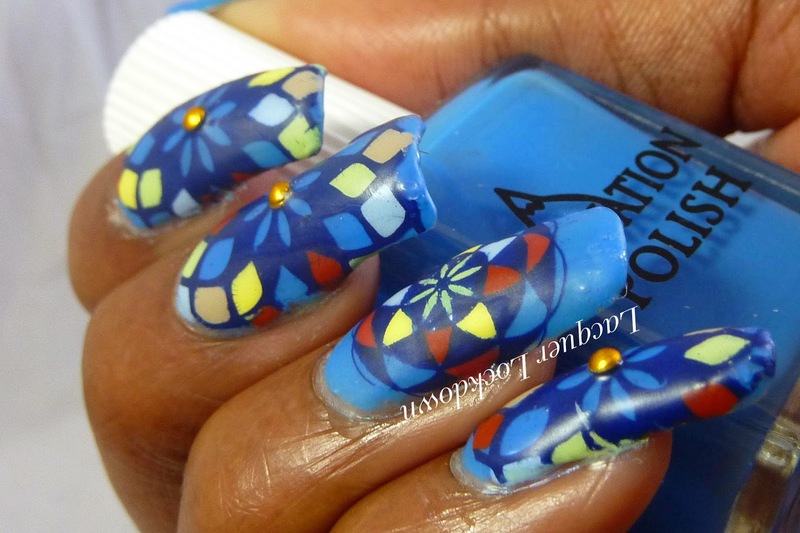 I probably have about 3 or 4 different polishes from as many collections here in this mani, and the colors really worked. White crelly with grey/gunmetal colored multisize glitter and small holographic glitters. 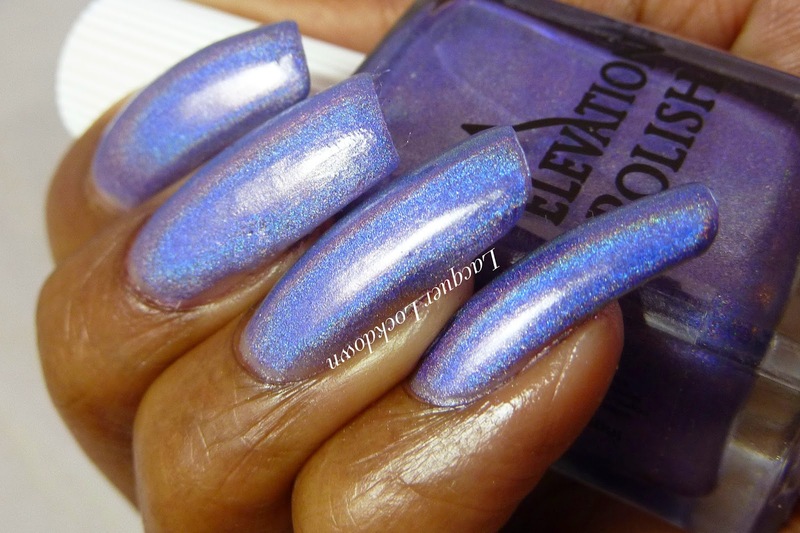 I think this might be the first white crelly I've ever seen from Elevation Polish. It was definitely the first I've ever seen with this kind of glitter which means its wholly unique within my collection. I found myself thinking I'm not sure I can do nail art on top of this! It's delicate yet has a substance at the same time. I required 3 coats for opacity. I would warn you to take your time and let the polish dry a bit between each coat to prevent dragging. But of course I did create nail art over it because this is Lacquer Lockdown and we don't play that over here ;) I decided to take advantage of the fact that this polish is so jam packed with glitter to showcase it underneath leadlight flowers. I was pretty pleased with the results too! Somehow I managed to conserve all the elements about this crelly that I love while adding a punch of color to the mix! A medium toned green with little blue and gold shimmers mixed throughout. God I freaking love this polish! This color of green is the kind that makes me drool. In fact when I opened my parcel it was the first one I lovingly caressed. Lol. Pathetic. This one dries semi-mattish and is a little patchy. This means take your time in between coats because if you do that it will level out. Pictured here in 3 coats with topcoat. So I'm not entirely sure about this look I created. 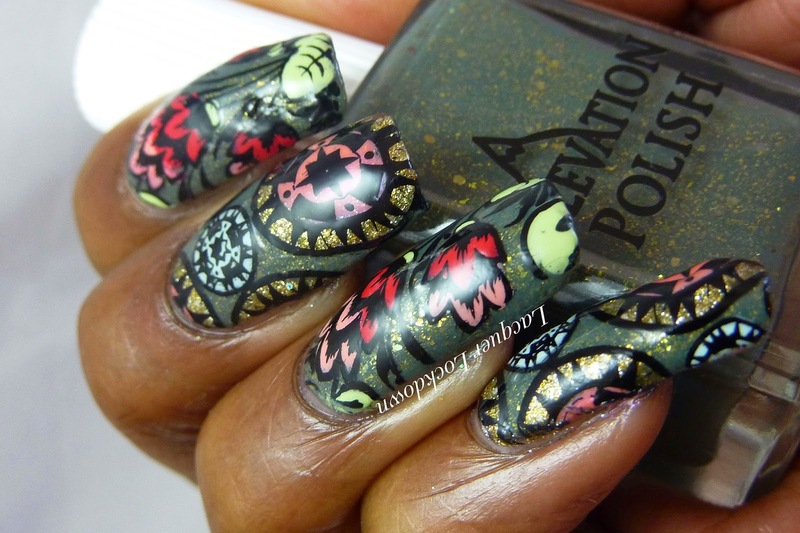 I was going for butterfly wings but the wings are so large they just took over my nails a bit. I wonder if you can still see it. I was happy I was able to capture all the shimmer living in Theo Worth though! Ruining my heart! Gah this polish is EVERYTHANG! I don't know Lulu said this was like a drab olive thermal packed with gold flakies. 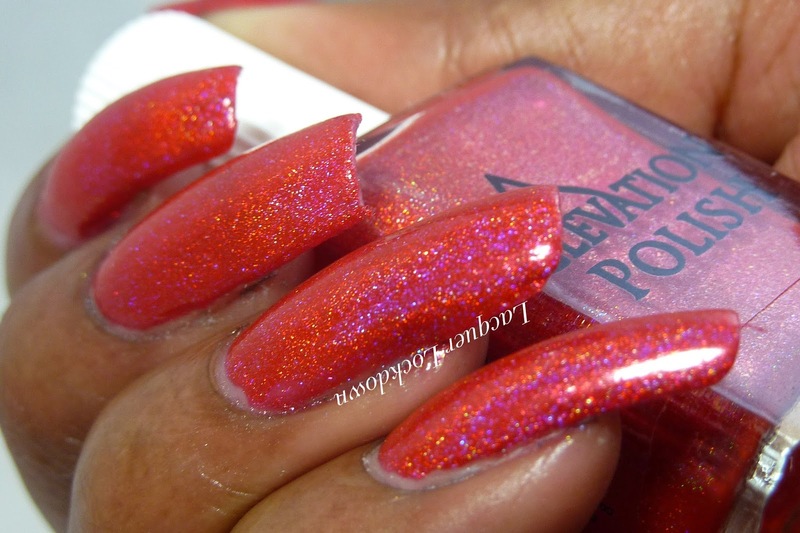 Let me tell you now there isn't a single thing drab about this polish! The gold flakies kill me! The cool tone is my favorite because again its another tone of green that I adore, but the paler green that comes out when its warm is also lovely. One great thing about having long nails is I can work a thermal like nobody's business. MCR is pictured here in 3 coats but was opaque in 2. Topcoat for maximum shine. Pet'la plus MCR in transition. 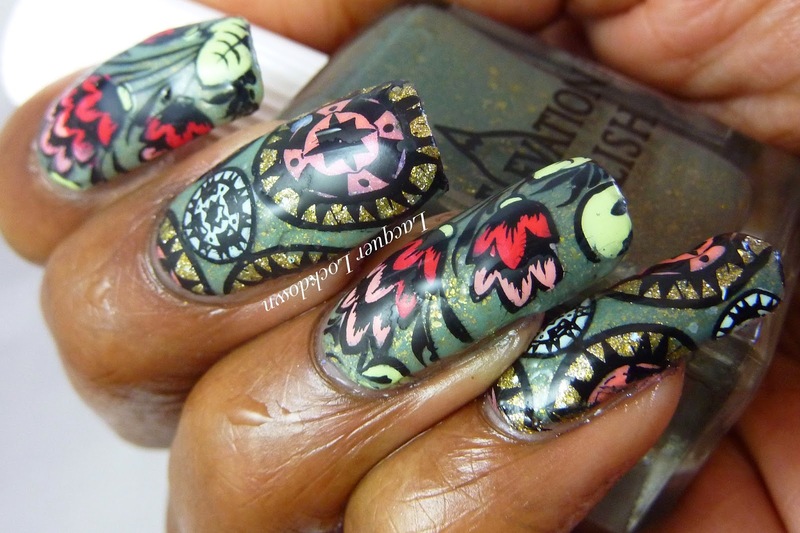 You are looking at my favorite nail art for this entire collection! It was hours of work and utterly utterly worth it! Flakies on fleek here! Because the transition is subtle I had to dip my nails quite a bit in water so that's why my nails are wet here. Ok this is everything! Everything killing me softly lol. Let me stop but I will be getting backups of this color. Its my first flakie polish - yes I am way behind but I wasn't really sure what all the fuss was about until just now. Strong strong strong linear lavender holographic. This is another one of those holo's that Lulu makes that requires sunglasses during wear to prevent burning away your retina. Yeah the holo is just that strong! Opaque in 2 coats pictured here without topcoat. The photo above is inside my lightbox - indirect light! Um yeah. The holo is just that strong. I was shocked when I went to look at these photos! Ohh exotic layerings. 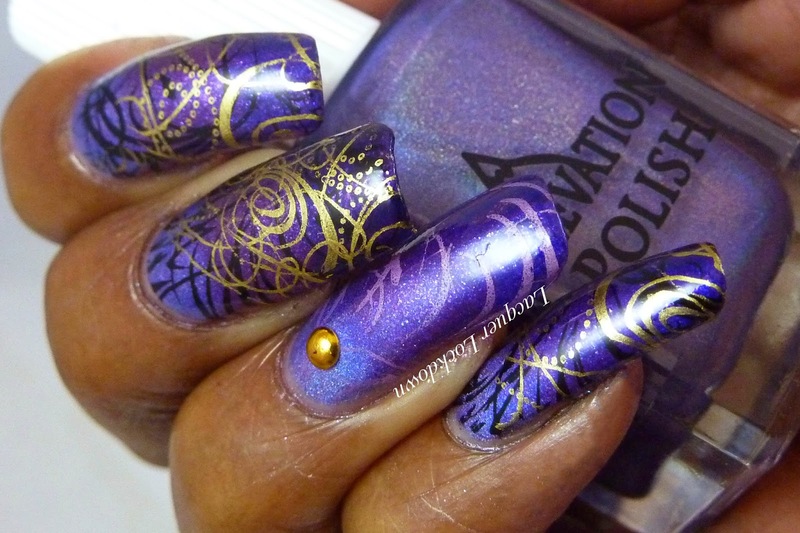 In case you didn't know Lulu has made a LOT of purples and so I chose to create a gorgeous gradient of a few of them for a lavish looking nail art. Yum! I love how this gradient came out! 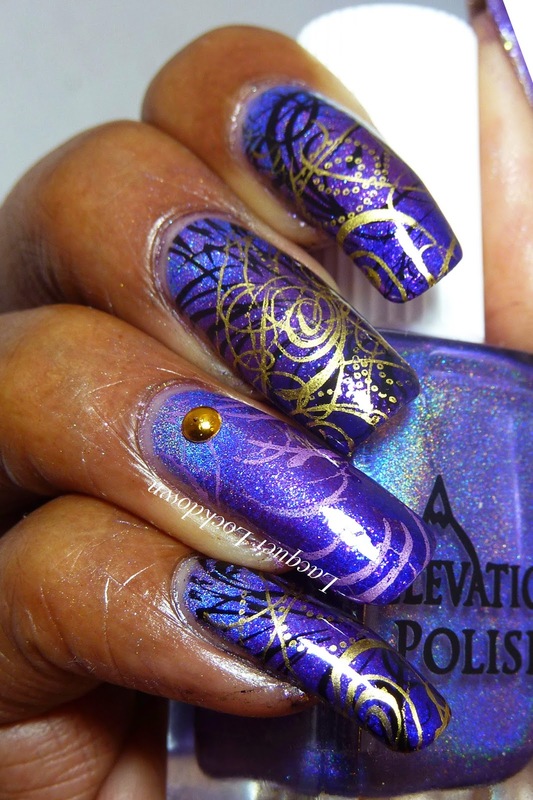 Rich purples blacks and golds. I was highly pleased with how this came out! Yeti Hides is a bright apple red holographic. Definitely not as strong as The Walker which I love because it allows the red to sit center stage. You might not know this but Lulu isn't the biggest lover of the red/pink family. Lol that's why she does them so well ;) Every time she creates a red polish or SBP I am dying to get my hands on it. I love red - A LOT! This one has tiny bit of orange undertone on me. Below are 2 coats no topcoat. I love this! 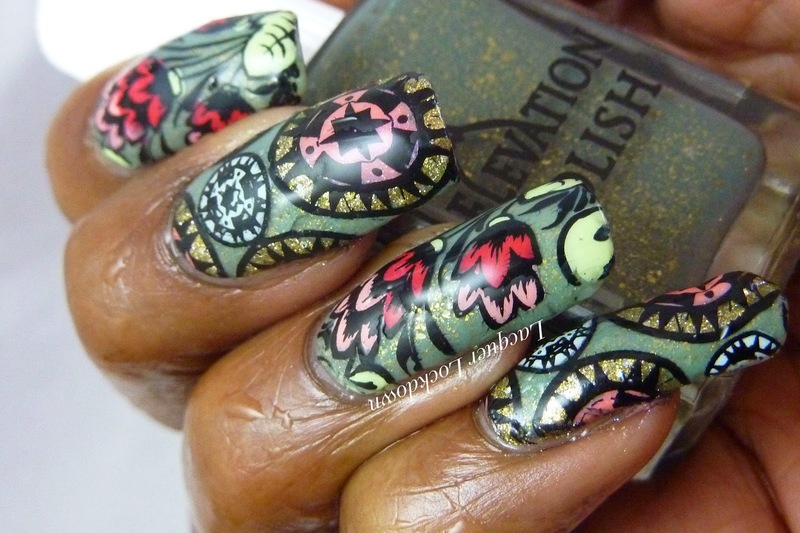 Watermarble is entirely insane here. 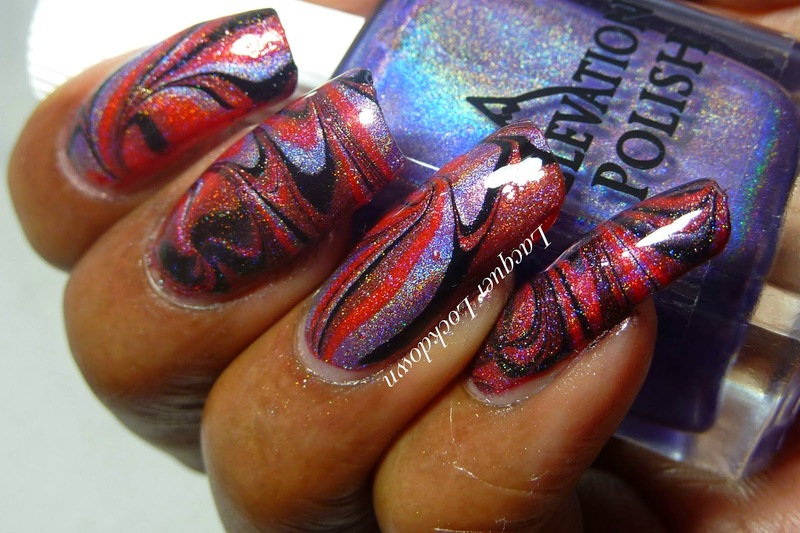 The thing about watermarbling with holos is if you include one with a strong linear it will "spread" for lack of a better word. That's why I pretty sure The Walker and Aiguilles d'Arves spread their holo out to Yeti Hides and even the black creme. So here we are one dead brill set of polishes later. What do you think? Any favorites? I have several backupables that I need. These polishes will be available for purchase on January 7th at 9PM CST and 22nd and AM CST. 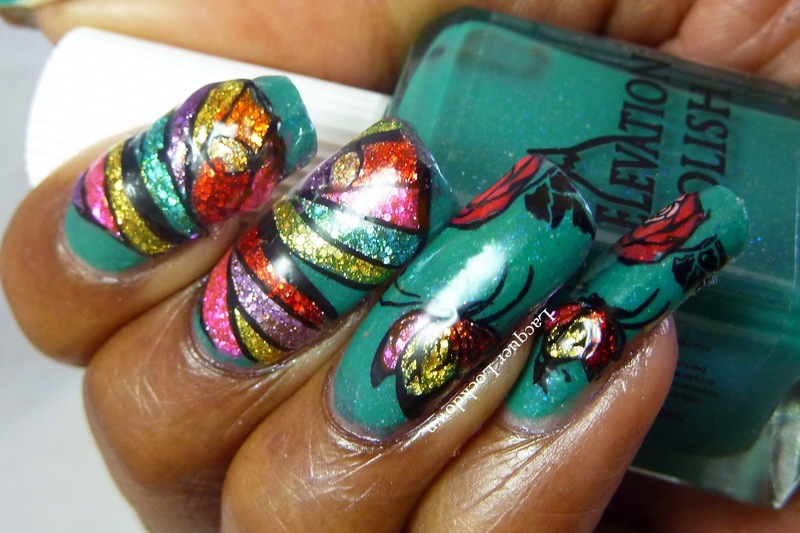 You can purchase these and more on the Elevation Polish Big Cartel website. Please don't forget that Yeti Hides A Mini Apple is a limited edition for the month of February only so get it while you can! Mill City Ruins and possibly The Walker will definitely be mine tomorrow! !